I've made two batches of white wine vinegar this year and both were a great success. Vinegar is easy to make and, like just about every other thing made with care at home, it tastes better than store bought vinegar. 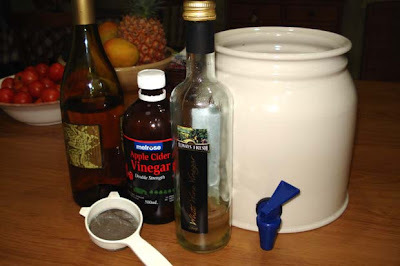 To make vinegar you need a crock, mother of vinegar and wine. Christmas is a good time to start making vinegar because you'll probably have left over wine, or your friends will. Instead of throwing it out, or leaving it to sour in the fridge or cupboard, why not make some vinegar! This is mother of vinegar made in cheap white vine vinegar I bought about 18 months ago. First you'll have to go looking for mother. No, not your mother, mother of vinegar. 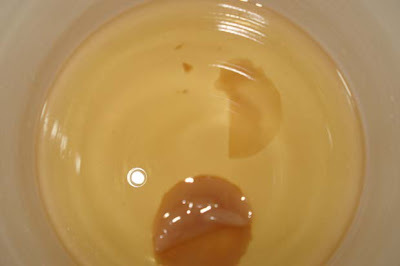 That is what the slimy disc of bacteria is called that sometimes forms on store bought vinegar. Pick up the bottles in the store and look to see if there's a floating disc of slime on the top. Strange but true, this is what you want! I first found mother of vinegar in a bottle of unpasteurized apple cider vinegar I bought at my local IGA. I thought the mother had formed because the vinegar was unpasteurised but since then I've had mother form in the cheaper vinegar I bought at a supermarket. Both of these are fine for making vinegar. It looks pretty ghastly but this is the mother sliding out of the bottle it formed in. You'll need a glass or pottery crock. I use the crock I used make my ginger beer in. I have a bigger crock for the ginger beer now. It has a little spigot that allows me to easily syphon off the vinegar. 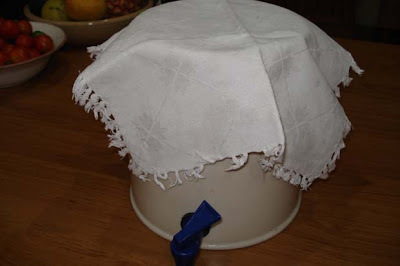 You'll also need a cotton or linen cloth to cover the crock so bugs and vinegar flies don't get in. You need air to enter but you don't want it to become contaminated with anything else. The only other thing you'll need is wine - this can be any quality. 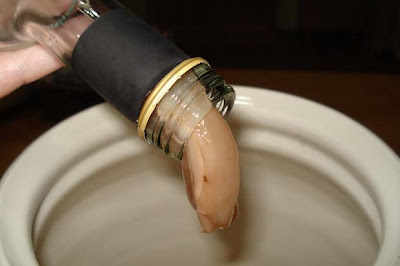 If you want red wine vinegar, you use red wine, or white wine if you want white wine vinegar. Don't mix the two. I'm making white wine vinegar. Just add the mother of vinegar to some wine. If you have a full bottle, pour the lot in, if not, start with a glass or two and add more wine as it becomes available. That's why I said Christmas is a good time to make vinegar - you can ask your friends to save any left over wine they have at parties. It's okay to add different kinds of white wine to the one bottle, ditto with the red wine, but don't mix red and white white together. The mother of vinegar and white wine in the crock. That's it. Once it's mixed together you just cover it and wait. Like sourdough starter, home made vinegar improves with age. You don't empty the crock, you always keep some of the old mix to blend with the new additions of wine. Your matured vinegar will infuse the new wine with its flavour. Each time you make vinegar with some of your old vinegar added, it will have a greater depth of flavour. The best way to tell if your vinegar is ready is to taste it. It will probably take between two and four months to mature, if the temp in your home is around 25 - 30 C degrees (around 80F). It will take more time in colder temperatures. This is another of those old skills that is worthwhile taking some time with. You'll get good vinegar along with the satisfaction of knowing it's yet another thing you can make at home. 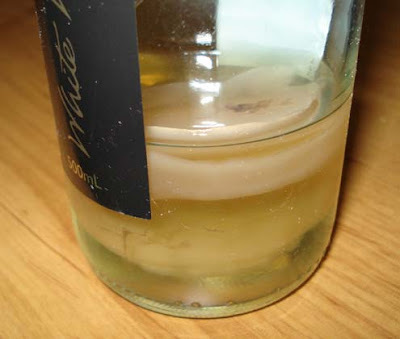 Don't forget to save any good bottles and corks for storing your vinegar once it's matured. Now that is VERY cool Rhonda - even I could do that! love it! i'm learning so much from you! This is fantastic. I think I might do this as a project with my stepdaughter this summer. 4 weeks at 80 degrees?!? Good Lord how can you stand it? My house is 80 degrees maybe a week or two out of the whole year and we get so ho we strip down and stand in front of the fan panting. I'd be interested to know how long it takes in more comfortable climes - say 60ish? So neat! You are endlessly resourceful. :-) Have the merriest of Christmases! I did not even know that vinegar was something that could be made at home! Such a very informative post! It looked so easy too. I just bought two bottles of whte wine vinegar today. If only I had known what to look for. Thanks for the info, Rhonda, I am sure it will come in handy. Very interesting, Rhonda. I admit that when I saw the mother of vinegar, I said, 'eww' :P - useful, though! Very good article, as usual. Do you know of an economical way to make copious amounts of vinegar for cleaning and clothes rinse purposes? Thanks so much for putting that excellently detailed picture. We were panicking about seeing the mother in some high end white balsamic we bought, and not knowing whether it was safe to use. Your picture saved us. Thanks again! Karen, that one is the bottom of a water cooler. It would usually have a large plastic bottle of water on the top. I bought it at an op shop. I think the one at Kunda Park might have them. I'm excited to make my own now, however I'm a little confused on what is the correct ratio of vinegar with mother to white wine is. Please advise if it's 1 to 1 and / or could it be less, say three to one. Can I keep the mother? If so, how?